With Easter a mere ten days away, I thought I would let you in on a little family secret. It is actually quite exciting. Edge of your seat kind of stuff. Headline making really, albeit at a very small newspaper. The kind of insider information that will most certainly make you the star of your work water cooler for at least an hour. O.K. Enough build-up. And the scoop is: (insert drum roll here) my beauties are getting baskets for Easter! And they look like this. As I think about it, in hindsight, that probably wasn’t very exciting for you at all. Sorry. So sorry. I think I was caught up imagining the pure joy my children will experience on Easter morning. But if I’m honest I think I am just so excited for myself too. I am actually ahead of the game. The baskets are all put together. All ready to go. All ready to rock their world. I know the baskets and their contents aren’t for me but I totally geek out about this stuff. 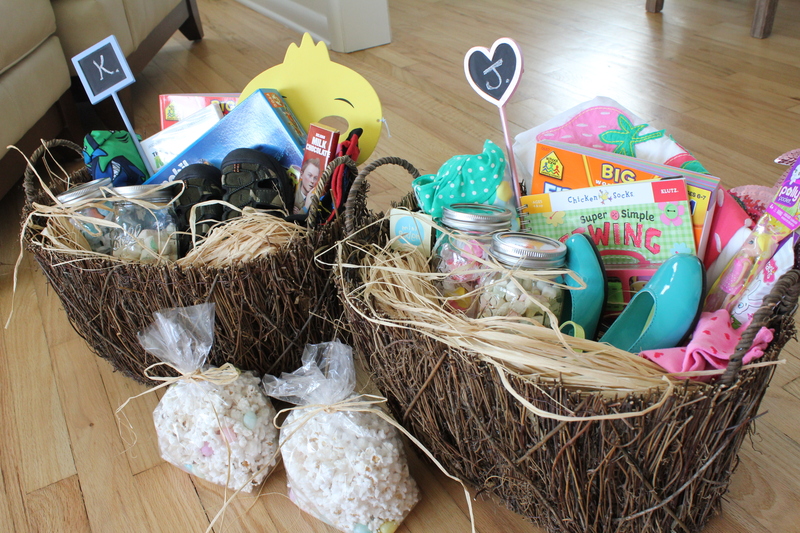 I think about Easter baskets for months. I think about what I’m going to fill the baskets with, what the basket is going to look like, if I’m going to go with a theme or not, what I need to buy for our kids anyway that I can totally pull off as a gift. That’s normal, right? 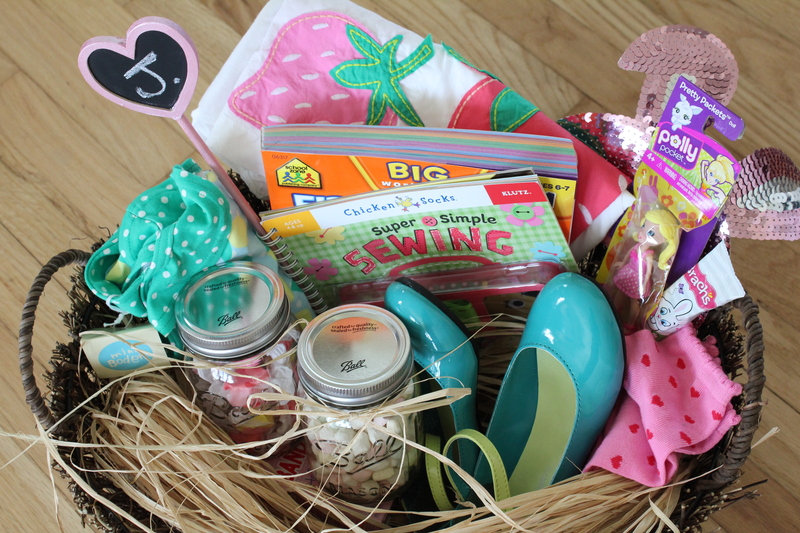 The first task of Easter basket business is to get a basket. I scored these two at Target. I actually found them on a random end-cap with some other pretty Easter decor; bunnies, candle, egg wreaths, the like. I am already plotting where I can use them in the house once they’ve run their Easter course. 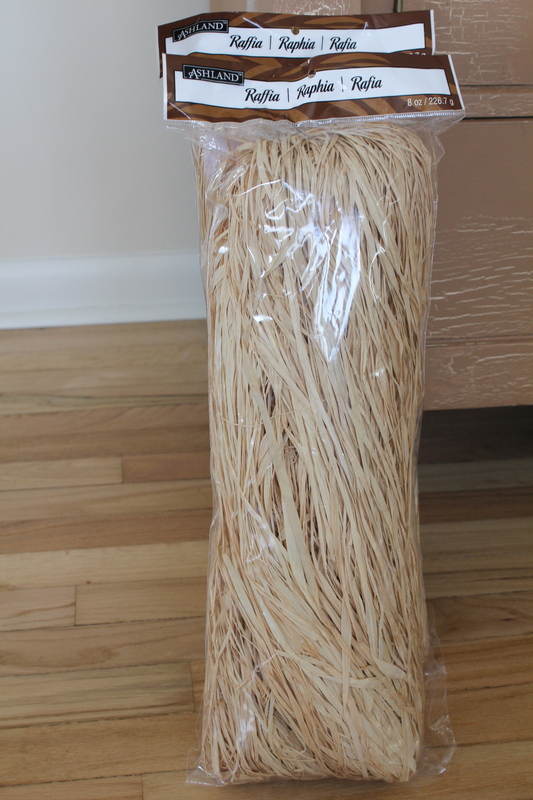 I filled them with raffia. Each basket took a full bag. I used 40% off coupons at Michaels so they only ended up being $3.60 each. 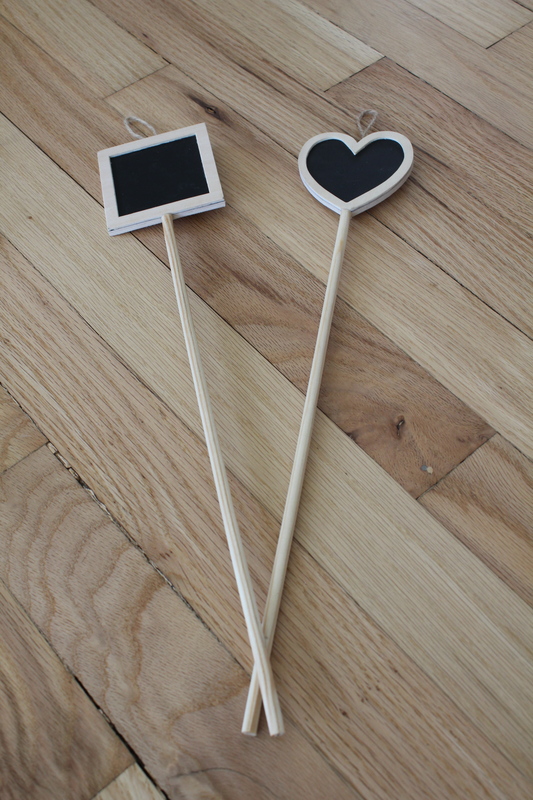 And while I was buying the raffia, I stumbled upon these two adorable little chalkboard sticks. 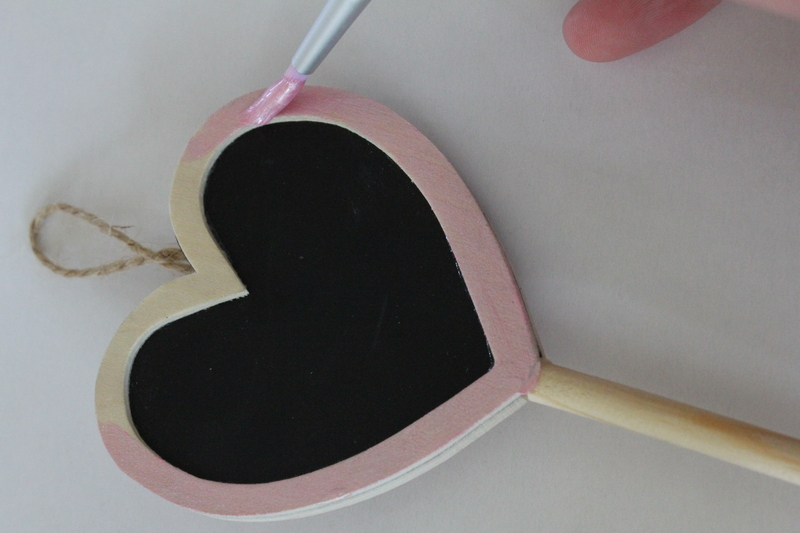 I painted my daughter’s with Martha Stewart Crafts Pearl Paint, Pink Taffeta. And my son’s with Folk Art Craft Paint, Hydrangea. I was really happy with the way they turned out. And for 99 cents each, what a steal! 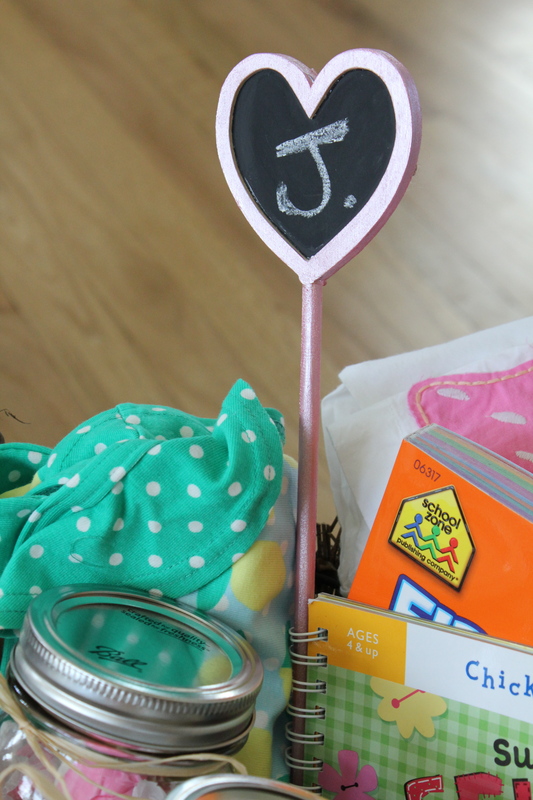 I then wrote my children’s’ initials with chalk and stuck them in each basket. A nice personal touch. They also act like a gift tag, just in case there is any confusion over whose basket is whose. You know the shark swim trunks and Batman socks could go either way. I then filled a mason jar with the most amazing salt water taffy. The strawberry actually tastes like a real strawberry, the pear just like a pear, the peach just like a peach. Well, you get it. Thank you Russell Stover! 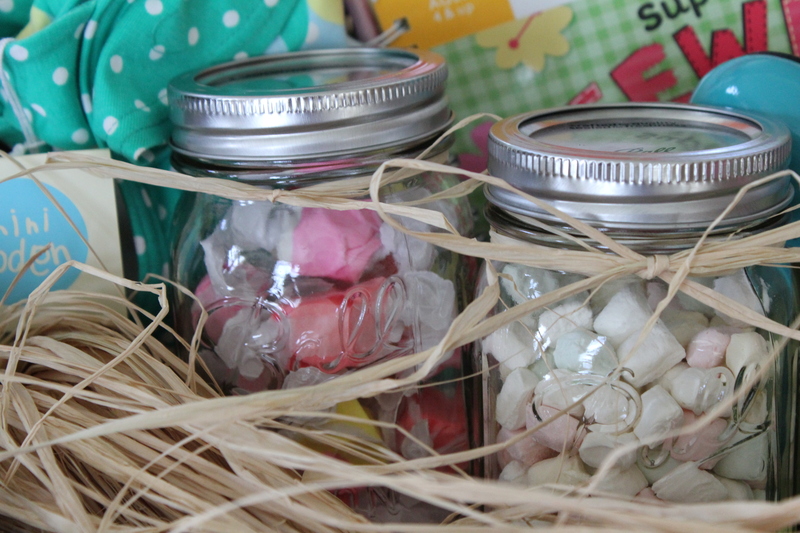 And the second mason jar is full of yummy pastel (Beaut.one) and jelly mints (Beaut.two). 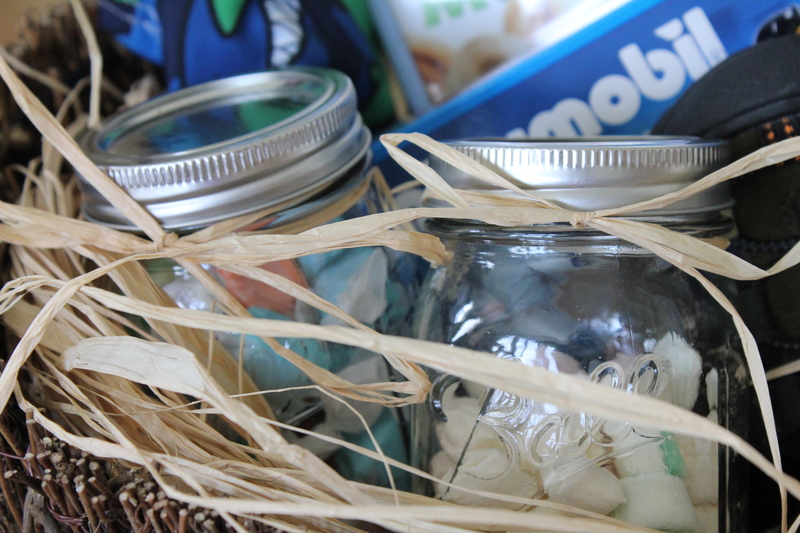 It is a good thing those jars seal up tight because my sweet tooth has never met a pastel mint it didn’t like. What is Easter without jelly beans? 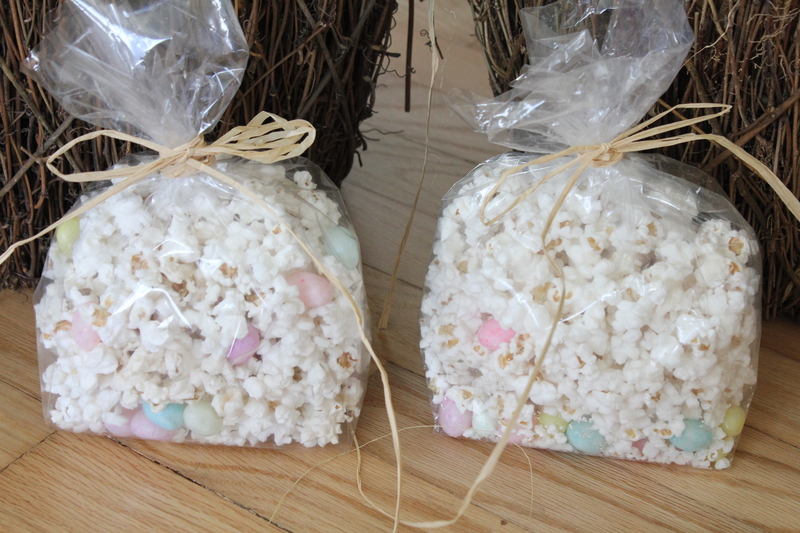 I popped some delicious popcorn (see how to make your own homemade corn here) and sprinkled in some jelly beans. Salty and sweet. And now on to the gifts. I really try to collect things all year long. And I also like to include some items that we would normally buy the kids anyway, like swimsuits or socks. It is a cost effective way to fill their baskets and in my experience they love a new suit or a new pair of socks just as much as a new toy. My kids are so funny and kind that way. -Attire: A new swimsuit and swim cover-up. We get our kids a new suit each Easter before summer pool season hits. And a new pair of shoes. Seriously, a girl can NEVER have too many shoes. Plus, these match the new suit. Oh, and pink heart socks. Socks are so fun. -Smarts: A workbook loaded with fun and challenging worksheets, puzzles, etc. Easter is a perfect time for this too because we tend to bust these out more once school is done for the summer. -Fun: A Polly Pocket toy I found on the clearance rack after Easter last year. It was a blessed day when my daughter was finally old enough to dress and re-dress and then dress again her own P.Pockets. Those little rubber outfits can be down-right maddening. 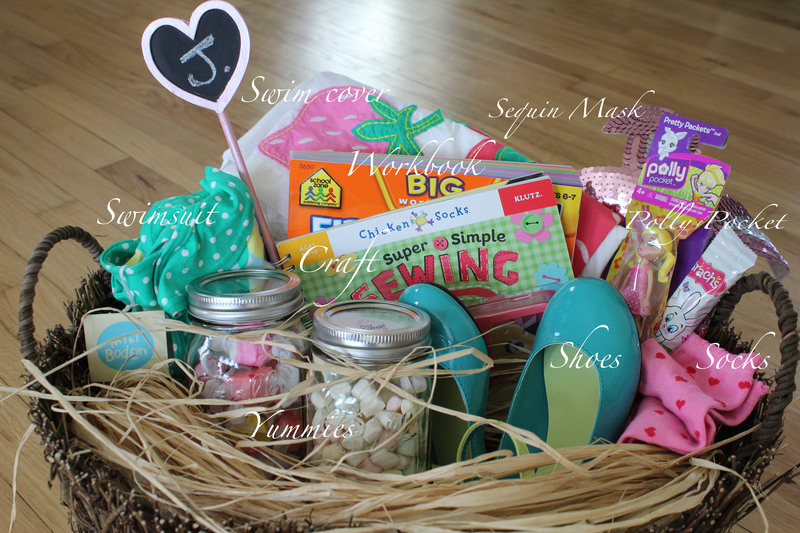 My girl loves to craft so no basket of hers would be complete without a shout out to craftiness. We bought her this adorable beginning sewing kit. I am secretly hoping she learns how to sew and then teaches her ol’ Mom. And finally, a sequin bunny mask. Just because sequins are shiny and fun and I am always on the hunt for my next photo op. -Attire: A new swimsuit. He is going to just love it. My son loves sharks. I can already hear him roaring. I am pretty sure sharks don’t roar but being scientifically accurate isn’t his main life goal right now. Snacks are. A new pair of shoes are in order for my boy too. But for a totally different reason. He wears out shoes like it is his job. So he always needs new kicks. My son was with me months and months ago when I bought this pair of Batman socks. And every week or so he will ask where they are. Soon buddy! So very soon. -Smarts: A workbook full of learning activities too. 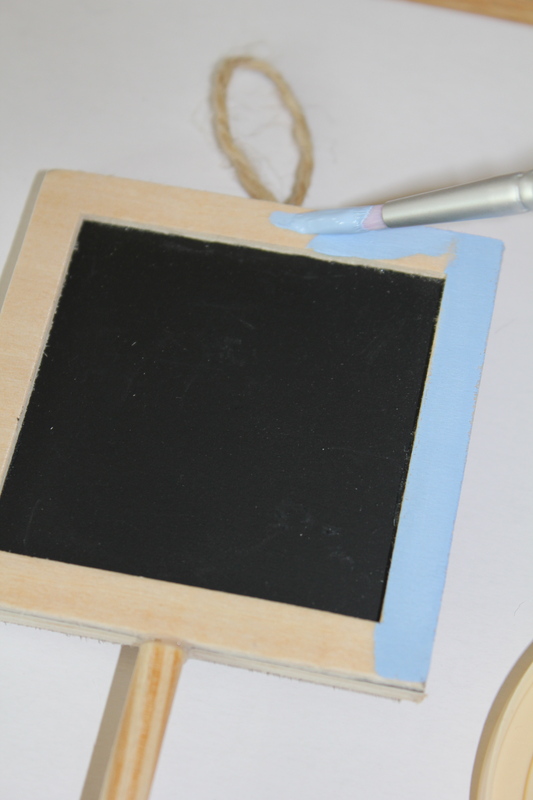 He has been using one his sister had already completed so he will be beyond thrilled when he gets his own. I can feel his brain growing already! -Fun: The latest Muppet movie. Does anything scream fun more than The Muppets? They do literally scream. Often. We love Playmobil toys around here and this new firefighter set will add nicely to his collection. I feel safer already. 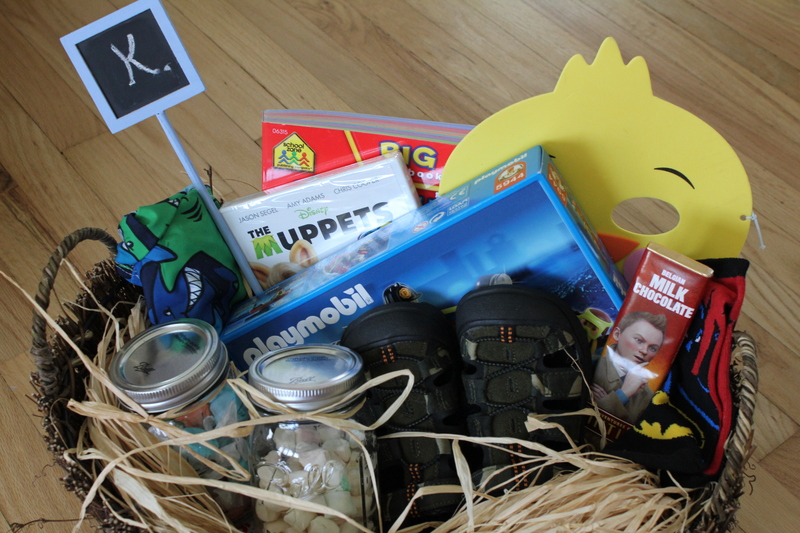 And the duck mask? Well, I have plans for some fun photos. A mom can hope can’t she? 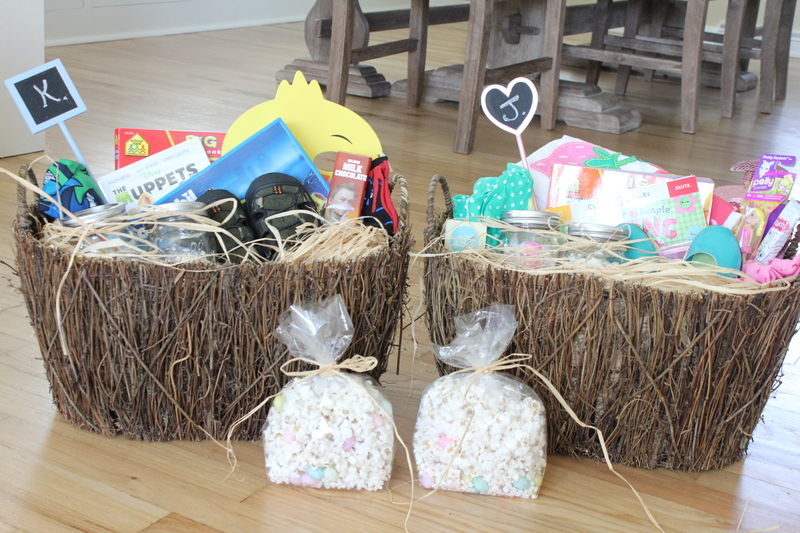 The contents of these baskets are between you and me until April 8th. Deal? 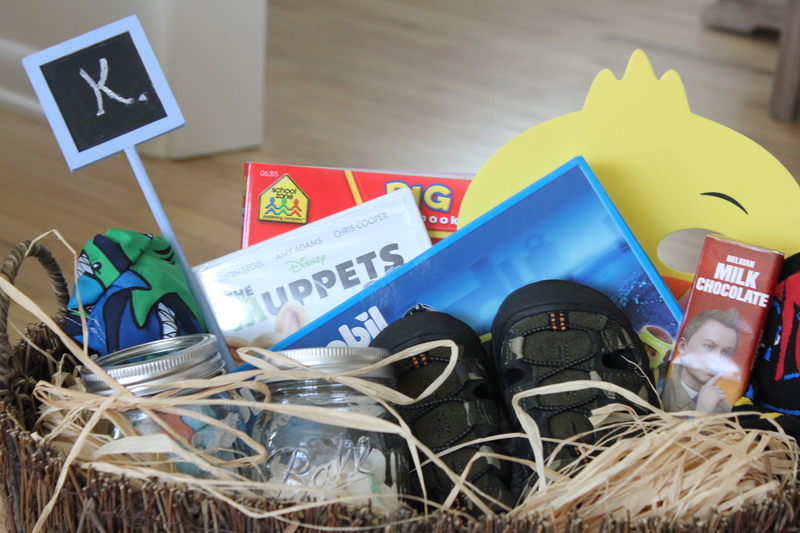 Here’s to you filling all the Easter baskets in your life with happy! 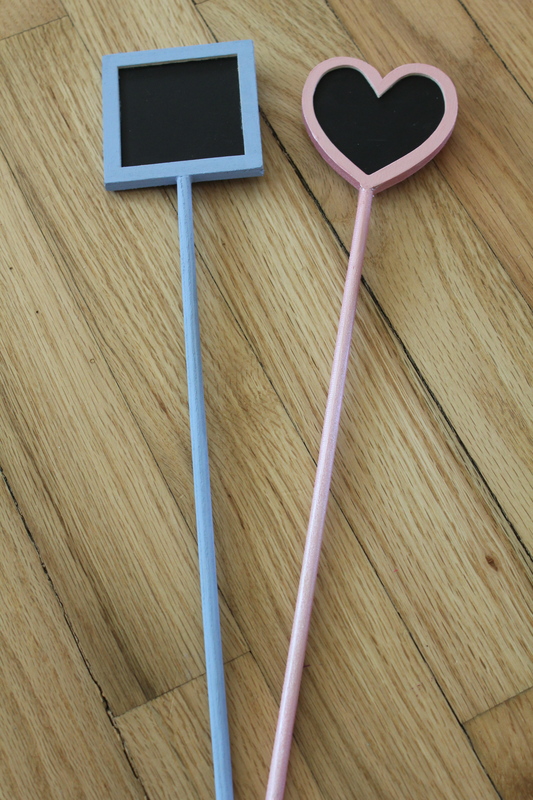 It’s official……I’m putting you in charge of our Easter baskets next year! And feel free to make one for me while you’re at it! Love them….and you! Wow! Those baskets are really something–creative, attractive, useful, and not overloaded with sweets–well done! Robin, Thank you so much! 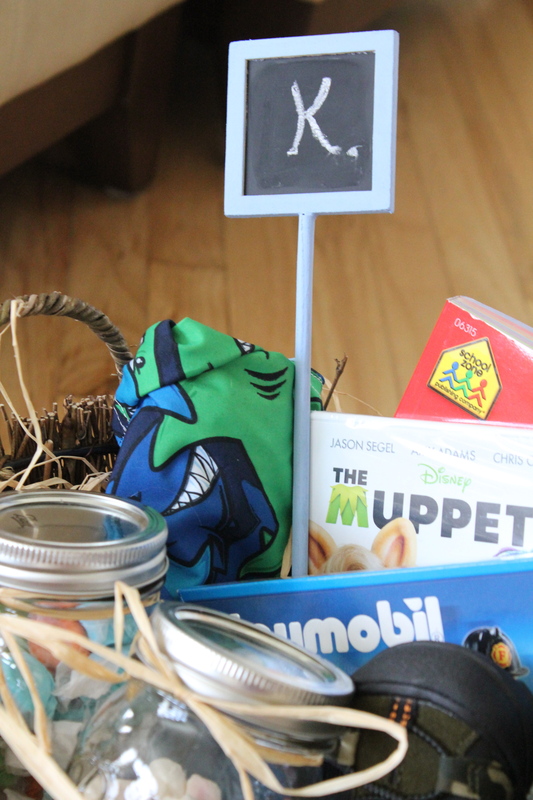 Easter baskets are so much fun. Happy Monday!